October 22nd, 2013: Cell Renew augments its skin care portfolio with the introduction of a range of Face Cleansers. Specially formulated to fight everyday sources if damage, the Cell Renew face cleansers designed with dermatologists are infused with the goodness of Vitamin Nutrients. also nourish your skin with every wash.
Pollution Protect face cleanser hence keeps your skin purified, protected and nourished. 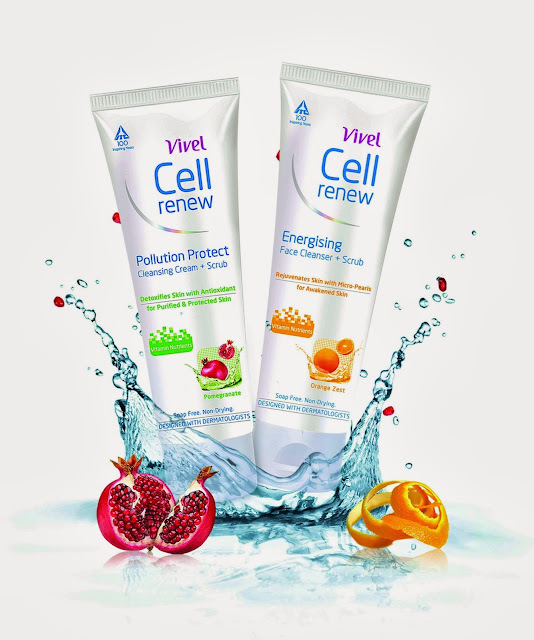 Cell Renew Energizing Face Cleanser + Scrub is specially designed for evening use. Energizing Face cleanser rejuvenates skin after a long stressful day. Infused with Orange Zest and Micro Pearls, this face wash has an energizing action that removes sebum and stickiness to alleviate signs of day-end dullness for rejuvenated and awakened skin. Rs. 139 for 100 ml tubes. In keeping with the ITC ethos of delivering products par excellence, the brand Vivel has been built on the philosophy of delivering superior functional benefits with strong differentiated propositions. Vivel seeks to stay relevant to the evolving Indian consumer by offering her greater value through product and packaging innovations. The brand is endorsed by stars like Kareena Kapoor, Mahesh Babu, Trisha & Dev.